“Simultaneous determination of the magnitude and the sign of multiple heteronuclear coupling constants in 19F or 31P-containing compounds” by Josep Saurí, Pau Nolis and Teodor Parella. Magn. Reson. Chem. 53, 2015, 427-432. To a solution of (E)-(2-((6-chloro-5-fluoropyrimidin-4-yl)oxy)phenyl)(5,6-dihydro-1,4,2-dioxazin-3-yl)methanone O-methyl oxime (14)(100 g, 0.564 mol) in toluene was added 2-chlorophenol (54 g, 0.846 mol), K2CO3 (50 g, 0.733 mol), and DMF (50 mL) at ambient temperature. The reaction mixture was stirred at 50-60° C. for 3-4 h. The progress of the reaction was monitored by the HPLC analysis. Upon completion of the reaction, aqueous NaOH (10%) (200 mL) was charged followed by water (300 mL). The mixture was stirred and the toluene layer was separated. The toluene layer was washed with a solution of brine (600 mL). The final toluene layer was recovered completely to get the crude product. To the above crude product, methanol was charged and heated to 60° C. until the clear solution is formed. The solution was stirred at room temperature to get the pure product precipitated. The pure fluoxastrobin product was filtered and washed with methanol. The product was further dried to obtain the pure fluoxastrobin product meeting the desired specifications. Yield—75-88%. IR (cm−1, KBr) 3072.99w, 2981.58w, 2936.76s, 2819.79w, 2502.01w, 1601.14s, 1572.37s, 1447.88s, 1305.43m, 1268.11m, 1217.15m, 1191.21m, 1092.60m, 1049.05m, 1001.26w, 910.25w, 762.81w. 1H NMR (CDCl3, 400 MHz) δ 3.846 (s, 3H), 4.170-4.160 (t, J=4 Hz, 2H), 4.464-4.484 (t, J=4 Hz, 2H), 7.261-7.295 (m, 2H), 7.322-7.409 (2, 4H), 8.069 (s, 1H). 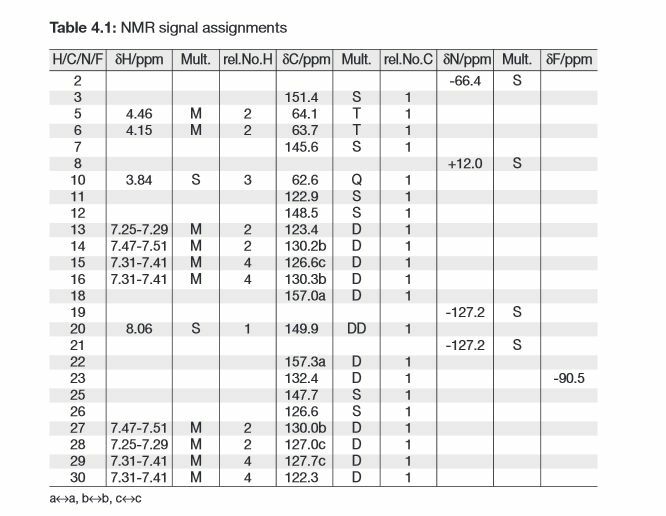 13C NMR (CDCl3, 400 MHz) δ 63.103, 64.153, 64.550, 122.659, 123.259, 123.823, 125.712, 127.150, 127.397, 128.094, 130.511, 130.679, 130.776, 131.473, 134.138, 146.004, 148.166, 148.943, 150.354, 150.478, 151.819, 157.395, 157.466, 157.783, 157.854. MS (EI) m/z 459.1 (M+1); MS2 (EI) m/z 427.1, 383.0, 366.9, 342.1, 306.2, 246.0, 231.1, 188.0. HPLC (Area %): 99.40%. M.P. 108-112° C.
Isomerisation of (Z)-Fluoxastrobin to (E)-Fluoxastrobin using methane sulphonic acid. To a stirred solution of (Z)-Fluoxastrobin (0.3 g; 0.65 mmole) in acetonitrile (3 ml) was dropwise added methane sulphonic acid (0.04 ml, 0.65 mmole) at an ambient temperature. The reaction mixture was stirred for 2-3 hr at the same temperature. The progress of reaction was monitored by thin layer chromatography (TLC). Dichloromethane (5 ml) and DM water (5 ml) was added to reaction mass at an ambient temperature. After vigorous stirring, the layers were separated. The aqueous layer was back extracted with dichloromethane (5 ml) and the combined dichloromethane layer was washed with 10% aqueous sodium bicarbonate solution (20 ml) followed by washing with 10% brine solution (20 ml). Dichloromethane was distilled off at reduced pressure at 35-45° C. to obtain (E)-Fluoxastrobin as crude product (0.25 g, 83% of theoretical yield). Crude fluoxastrobin on purification in ethanol affords pure (E)-Fluoxastrobin. 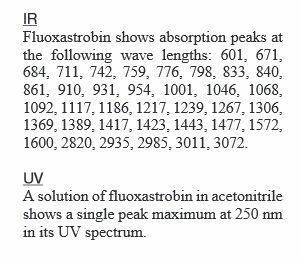 Isolated product HPLC purity (% area): (Z)-fluoxastrobin: 1.02% and (E)-fluoxastrobin: 95.92%. Isomerisation of (Z)-Fluoxastrobin to (E)-Fluoxastrobin using phosphoric acid. To a stirred solution of (Z)-Fluoxastrobin (0.25 g; 0.54 mmole) in acetonitrile (4 ml) was dropwise added phosphoric acid (0.03 g, 0.54 mmole) at an ambient temperature. The reaction mixture was stirred for 2-3 hr at the same temperature. Progress of reaction was monitored by thin layer chromatography/HPLC. Dichloromethane (5 ml) and DM water (5 ml) was added to reaction mass at an ambient temperature. After vigorous stirring, layers were separated. The aqueous layer was back extracted with dichloromethane (5 ml). The combined dichloromethane layers were washed with 10% aq. Sodium bicarbonate solution (20 ml) followed by washing with 10% brine solution (20 ml). Dichloromethane was distilled off at reduced pressure at 40-45° C. to obtained (E)-Fluoxastrobin (0.22 g, 88% of Theoretical yield). Reaction monitoring by HPLC (% area): (Z)-Fluoxastrobin: 6.79% and (E)-Fluoxastrobin: 88.84%. Isolated product HPLC purity (% area): (Z)-Fluoxastrobin: 6.94% and (E)-Fluoxastrobin: 84.43%. IR (cm−1, KBr) 3066.28w, 2981.58w, 2939.36s, 2825.71w, 2500.61w, 1602.36s, 1572.76s, 1441.05s, 1297.05m, 1218.17m, 1116.52s, 1046.15m 1000.86w, 904.73s, 764.71w. 1H NMR (CDCl3, 400 MHz) δ 3.983 (s, 3H), 4.163-4.218 (t, 2H), 4.432-4.440 (t, J=3.2 Hz, 2H), 7.217-7.352 (m, 4H), 7.371-7.390 (m, 2H), 7.483-7.516 (m, 2H), 7.702-7.722 (d, J=8 Hz, 1H), 8.016 (s, 1H). MS (EI) m/z 459.1 (M+1); MS2 (EI) m/z 427.0, 382.9, 366.7, 340.0, 305.8, 246.1, 188.0. HPLC (Area %): 99.11%. M.P. 150-152° C.
Literature References: Leaf-systemic broad-spectrum fungicide for use in cereal and food crops; member of methoxyimiodihydro-dioxazines. Prepn (stereochem. 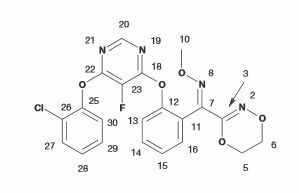 unspecified): U. Heinemann et al., DE 19602095; eidem, US 6103717 (1997, 2000 both to Bayer). Comprehensive description: S. Dutzmann et al., BCPC Conf. – Pests Dis. 2002, 365. Field trial in winter wheat seeds: I. Haeuser-Hahn et al., BCPC Int. Cong. – Crop Sci. Tech. 2003, 801. Series of articles on chemistry, biology, determn, and environmental fate: Pflanzenschutz-Nachr. Bayer (Engl. Ed.) 57, 299-449 (2004). Ecotoxicology: P. Breuer, ibid. 319. Properties: White crystals with slight characteristic odor, mp 103-108°. bp 497° (est.). d420 1.422. Log P (octanol/water): 2.86 (20°). Vapor pressure at 20° (extrapolated): 6 ´ 10-10 Pa. Soly at 20° (g/l): n-heptane 0.04; 2-propanol 6.7; xylene 38.1; dichloromethane >250; in water (mg/l): 2.56 (unbuffered); 2.43 (pH 4); 2.29 (pH 7); 2.27 (pH 9). LD50 in rats, bobwhite quail (mg/kg): >2500, >2000 orally; LC50 (96 hr) rainbow trout, bluegill sunfish, carp (mg/l): 0.44, 0.97, 0.57 (Breuer).